POINT3 Wellbeing supported the AEO (Association of Event Organisers) Forums in January 2019 with a series of wellbeing talks focused on stress and how to find flow at work in the context of performance – understanding that not all stress is bad stress. The AEO is the voice of the event organising community. It serves and promotes the interests of event organisers and the events industry at large. This year’s AEO Forums delivered a holistic mix of intellectual stimulation, social networking, physical health and emotional wellbeing. 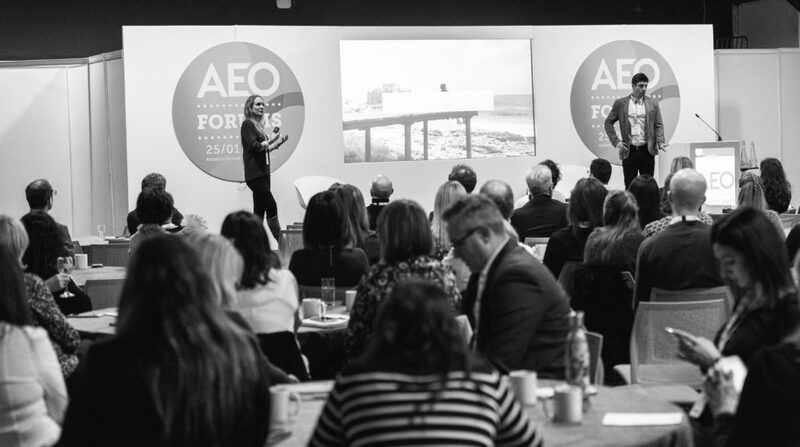 Held at the BDC (British Design Centre) London, the AEO Forums brought together 94 businesses from across the events industry. Sarah Mayo and Siôn Stansfield, two of the co-founders of POINT3 Wellbeing delivered three talks to the three different streams of over 310 event industry professionals spanning marketing, sales and operations. The talks explored stress in the context of the events industry – (one that is consistently ranked as one of the most stressful industries to work in behind the military and the emergency services) – before unpacking the science and symptoms of stress, providing some hacks to help the audience better manage the effects of stress and sharing insights into the benefits of having the right level of stress to perform at your best. Hailing from the events industry themselves means both Sarah and Siôn understand first-hand the high-pressured nature of the industry. This enabled them to empathise better and share some of their own experiences and practices that have worked for them. During the sessions, the audience were invited to take part in three polls providing some insight into the industry in terms of stress and how this is currently perceived and managed by those in attendance. 70 percent of the audience (across all three streams) ranked the events industry at a 7 or more on a scale of 1-10, where 1 is not stressful and 10 is highly stressful. The operations stream found the industry the most stressful of all streams, with 49 percent ranking the industry at an 8 or more. Physical exercise is the number one means that the audiences currently manage their wellbeing on a week-to-week basis with 54 percent selecting this option. Just 5 percent of the audiences said they currently had a regular mindfulness/meditation practice. And as many as 18 percent of the audience currently don’t have a regular means of managing their wellbeing at all. 49 percent of the audience would like to see their workplace provide more opportunities for them to build their personal wellbeing needs into the working day. And 38 percent said they would like to see more flexible working conditions, including hours of work, and location.